With the new addition of the panel in the “View” tab that only pertains to Model Space viewports [shown here], you might want to know where to set your Paper Space viewports. 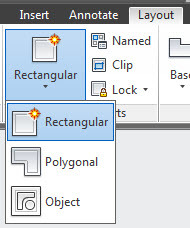 In AutoCAD 2013, you now have a new tab on the ribbon called “Layout” (Shown below). This tab of the ribbon displays differently depending on whether Model Space or Paper Space is active. All of the old functions (prior to 2013) are available in this new tab. 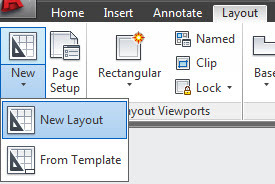 Previously found by right-clicking a layout tab, creating a layout tab from scratch or from a template is found in the ribbon. Dont forget that the command alias MV <enter> lets you quickly pick 2 points and easily create a viewport. I will show more of the features of the new “Layout” tab of the ribbon in future posts. Autodesk has made some great improvements in regards to model documentation which is found in this tab. 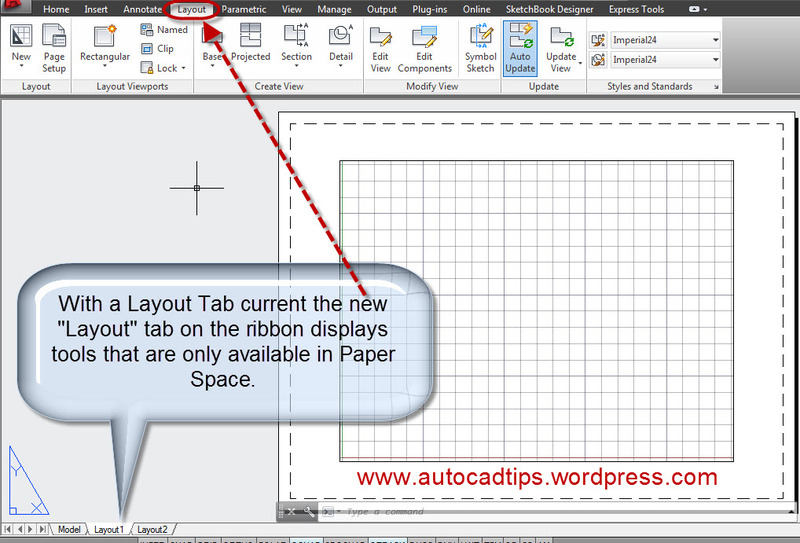 This entry was posted in AutoCAD 2013, BASICS, Layout, New In 2013, TIPS, Viewports. Bookmark the permalink. Thank you for the post, I didn’t realize there was a layout tab, mainly because when i installed 2013, it asked me to migrate my 2012 settings, and I believe there isn’t a layout tab in 2012. When I migrated my settings, it didn’t show a layout tab. I just selected Drafting & annotation from the pulldown at the top most of the cad window, and it now shows me a layout tab, albeit with not as many options, VP controls are there though. I also want aware of the MV command. Hi, thanks for this post, it helped me too. I’ve just started using 2013 (yesterday), and I think I have come across a glitch. When I create a polygonal viewport, the first time I right click it or bring up its properties, Autocad treats it as a viewport. However, after that first time, when you right click it or bring up its properties, they are all polyline properties, not viewport ones. I can’t figure out how to get the viewport options back. The practical upshot of this is that I can’t toggle viewport lock on and off, change viewport scale, ect. I’d recommend doing a repair of AutoCAD. I tried to recreate the error that you are experiencing and every time I checked it, the polygonal viewport was showing as a viewport in the properties palette. The paperspace origin was always at the bottom left of the dashed line that represented the printing extents of the attached printer, which never made sense to me, but now it’s moved and seems to have snapped onto some geometry of my titleblock. This doesn’t make sense either. IF it’s going to change, why not make it the bottom left of the paper that’s been selected to print on? I have no idea, What you said totally makes sense though. Hi, Go to Options and Display Tab. Look at lower left and check box that says Model/Paperspace tabs. Cheers! Our office just completed installing 2013 onto 3 computers, no one has the layout tab in the ribbon you show above. Last installation was careful to not allow “migration” for settings, and there is still no tab… suggestions? I have one suggestion. It would be easier to show in an image so I will email you as well. If you right click any where on the ribbon, you will see a little right click menu that says “show tabs” and “Show panels” – click on the “show tabs” and see if you see “layout” in the list. These lists are ways that you can control what tabs and panels are shown – that way you dont have tools showing that you may not need… Make sure that there is a check mark next to “Layout”. I hope that this may solve it. how does the CUI command work to install the layout tab? It is helpful when someone has updated to 2013 or newer and has migrated over their old menus or CUIs that don’t have this new tab of the ribbon defined. This shows how to add it to their migrated interface. Hello, great blog by the way! Very helpful indeed. So, i am having a complete brain fail…. (i have had a year off from Autocad and am back in the workforce and on Autocad 2013….whoa this ribbon takes some getting used to)….how do i do an isometric viewport?? I want to add an isometric drawing to my paperspace layout and can’t for the life of me remember how to do it? Thanks for your great help by providing information through this Blog. You are welcome. And thanks for your comment. I am happy that the blog is helpful. Hello i am using the Layout tab and I created a Viewport, how do I show a section without it affecting the rest of my Viewports or the model space? Is there a command for this? Hi I’m a fairly new user and xref’d some files in. I layed them out using viewports in paper space and it looked fine. When I went to print, none of the viewports were showing up and I was wondering if I needed to change the layers or what? Thanks for any help ! When you bring in an XREF it comes into your drawing kind of like a block in that it is all one object and it comes in (as a whole) into your drawing on one layer. Even though the XREF’d drawing might have multiple layers, if the layer that the XREF resides on is a non-plottable layer the whole XREF will not print. Hello, What is a shortcut / solution for when you are on paper space, and have already made a viewport and are editing the model from the paper space and are too zoomed in, how do you get back to the paper space without pressing ctrl+z (undo). Also, While in paper space and if you have overlapping viewports you can use Ctrl + R to cycle through viewports when it is difficult to make a certain viewport active. The following post describes Ctrl + R. You may need to click on the pictures to see them animated. I have been having issues with the blog lately. I am having an issue with line type scales being different in viewports compared to model space. I have recently started using Autocad electrical 2013 for drawing mainly electrical schematics. When i, for example, create a dashed line in model space, the dashes appear at a different scale when viewed in paper space. I end up having to trial and error different line type scales in model space order to get an appropriate looking scale in my view port in paper space. I use an A1 and A3 block for all my drawings. Is there any settings i need to adjust so that the line type scales look the same when viewed in model space and paper space. LTSCALE 1 (can be less than 1, your preference). ANNOSCALE set to your desired annotative scale if you use the feature. – style and standards . So I am using AutoCAD 2013 AND REVIT 2013 I MADE A CONSTRUCTION SET IN AUTOCAD 2013, and our office is now converting to REVIT, when I try to import one of the sheets from Autocad to revit, it says ” the paper space is empty would you like to import from model space” when I do that it makes it 100 times bigger then what it is in autocad. How do I import the file from paper space to revit. I’ve done this now for 4 other sheets but this is the only one that wont let me import the right way. If you have any suggestions please help!??! I have tried putting it on different layers and still doesn’t work. Help!! I’m using CADWorx 2013 and when I put the viewports in 3D Hidden they fade where you can barely see them. When you print preview they look like they’re made of pixels instead of lines. Is there a setting to change this? When you plot, is the “Plot with Transparency” option checked in the plot dialog box? This forces the plot to be “rasterized” (processed as a picture) instead of vectorized and has been known to create those annoying pixels. I need some help to get the layout templates in a tool pallet or in a ribbon. I created 10 layout templates in the formats A0, A1, …. etc. All of them are in one drawing and in different layout tabs. I need to give these templates to 150 users. First I assume, I can add these layouts to tool palette, like adding blocks, but couldn’t able to do that. Can you please give me a suggestion, how can I give my layout templates to all users? I’m opening a drawing created in AutoCAD 2012 in AutoCAD 2013. My computer got upgraded today. The viewport layer won’t show up in the drawings. All the layers are turned on and there are no layers frozen. The viewport layer also isn’t locked. I’m trying to move the viewport to a different location, but I can’t get the boundary line turned on. Do you know how to get the boundary of the viewport turned on? What layer is the viewport set to? If it is on the defpoints layer (a common issue) and then you freeze or turn off layer0 (zero) the defpoints layer becomes un-selectable. If this isn’t the issue you may need to run a “repair” on AutoCAD. Why is editing in the viewport from a layout page so slow to respond? I’m new to AutoCAD 2013 for Mac. I have multiple view ports on the same paper space layout. When I freeze a layer in one, it automatically freezes it in the other view port. I thought it might be because I had copied the view port, so I created a totally new one to test it – same results. God bless you :D i am a new User and this is very helpful. i can’t make 2 viewport in PS, when iam making another they removing previous one. The only time I’ve seen this type of behavior is when dealing with a lot of viewports and was able to be fixed by setting the MAXACTVP variable. This variable can be set up to a value of 64. But the minimum is 2, So I am wondering how many viewports you are dealing with. One more thing to clarify – Are you trying to add a regular viewport by using the MV command or are you trying to make use the new type of paper space viewports using the VIEWBASE command? Thank you so much its work,MAXACTVP. I have a complex .DWG that I am currently using at work. It is taking a long time to load the layouts when I click on the tabs is there anything I can do to speed this up? Thank you. Check out this description for the system variable LAYOUTREGENCTL which controls when switching tabs if it is regenerated. I am create a new layer in autocad and drawn a line but the line not shows on the viewport or paper space.why ? It sounds like you have a “Viewport Layer Override” This is where you can control a layer’s properties within that single viewport. You can make the layer not show (as I think this is what you are dealing with) and also change the color, lineweight, linetype…) If you do not want these overrides, try using the command/system variable VPLAYEROVERRIDESMODE to 0 (zero). Please help. How can I freeze certain objects in a viewport in Autocad 2013 but still want to show up in paper space. I know this might be simple but can you help. Thanks Peter.